iTero, high tech digital scanner which produces the most accurate impression in the world. No more mouth full of the putty gagging goop! 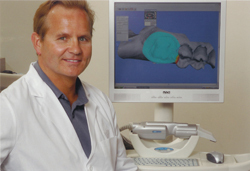 Dr Nimz worked with the Cadent Company to bring this state of the art equipment to dentistry for over two years. Now we are one of the first in the world to provide this exciting new technology. Easier impressions, precise fit of all our porcelain restorations means longer lasting and more beautiful crowns, inlays, and veneers.